Since his early childhood Chris Werren has been fascinated by the mountains and the related outdoor and sports activities. Especially powder snow skiing caught his interest and became his favorite sport. Already at the age of 3 he made his first skiing steps on the powdery snow ground in front of his parents’ farm house in the Bernese Oberland and later in his youth he spent a couple of summers on an alp. Since then his enthusiasm for mountain sports has influenced his work preference to a great deal. 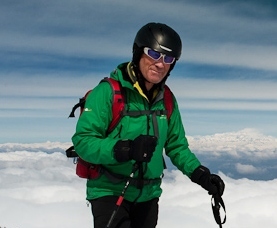 For many years he has been working all over the world as independent snow sports coach, as leader of trekking expeditions and as organizer of corporate outdoor incentives. Over the years he has developed a special love for the Himalayas, a mountain terrain which he has not only explored in the winter but also in the summer as leader of trekking expeditions in Nepal and India.